Peel the chestnuts raw, and then slice on mandolin as thinly as possible. Reserve for later. 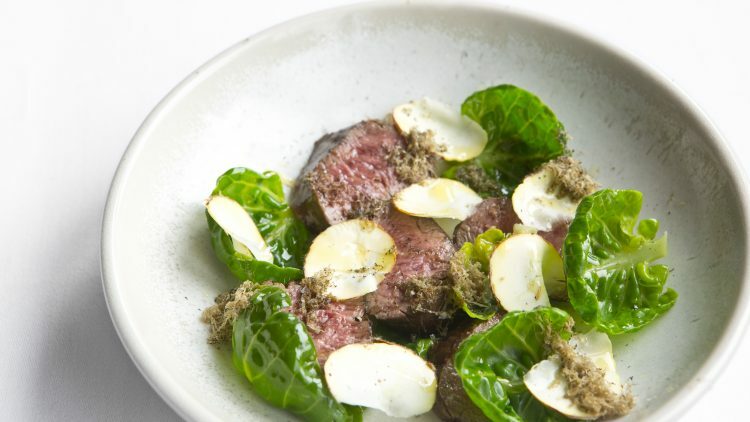 Season the venison fillet generously with salt and pepper. Using heavy based oven proof frying pan, Colour on all sides for 4 minutes. Add 20g butter and 2 sprigs of fresh thyme to the pan, and baste the venison fillets for a further 5 minutes. Remove from heat, pour away fat, and add the honey to the pan. Roll the fillets in the honey and add 50ml of good quality extra virgin oil. To dress dish: quickly warm sprouts in salty warm water with butter and lay them flat on the plate. Slice the venison fillet and place 4 pieces on each plate. Add the slices of fresh chestnut. Grate fresh chestnut over the top and finish with the cooking juices left in the pan, divided equally between four plates.